Tickets will be available for purchase at 3PM one week prior to the show. Tickets will be available for purchase at 3PM one week prior to the performance. Doors open at 7PM. The Moth StorySLAMs are steadily spreading all over the map, gathering people and stories from all over the country. New York, Los Angeles, Chicago, and Boston have multiple shows each month. 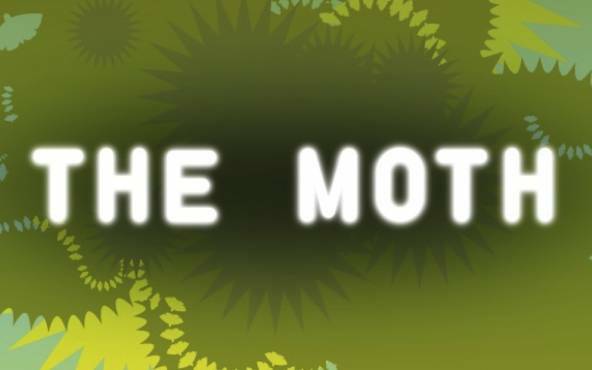 The Moth is open to anyone with a five-minute story to share on the night’s posted theme. The brave of heart, or those with stories they’re aching to tell, prepare personal, true tales. When the doors open, storyteller hopefuls put their names in The Moth Hat. A half hour later, names are picked, and one by one, storytellers take the stage. Each person has just five minutes! The ten featured stories are scored by teams of judges selected from the audience. Each StorySLAM generates a StorySLAM winner. After ten SLAMs, the winners face off in our GrandSLAM Championships. Come sign up to tell a story, or just enjoy the show! Prepare a five-minute story about regression. Going back in time. Rebounds and backslides. Tales of the vice versa, the inside out, and the topsy turvy. Revisit the scene of the crime. Press rewind. Prepare a five-minute story about flying high or flying solo, running from confrontation or soaring straight for it like a kamikaze. Please remain seated with your seat belt fastened. It’s a bird, it’s a plane, it’s you. Prepare a five-minute story about being left holding the bag. Taking the fall, feeling the heat. Your honor impugned, your good name sullied! Scolded, accused or rebuked! Share stories of pointing the finger, naming names, squealing. Getting over your guilt by passing along the blame or, confessing all. Mea Culpa, but the devil made me do it. Prepare a five-minute story about getting burned. Blistered by love, scalded by the powers that be, scorched by karma or just over-tanned. Tell us about the things that leave you smoldering. Sunscreen anyone? Prepare a five minute story about coming to the altar. Waiting in line for the midnight release of the next book in the series or singing your heart out on a Sunday morning. Tell tales of seeing the light or giving it up in favor of something else. Feeling the glory of the end of a 10 mile run, becoming an adult at 13, or finally making it to the last level. Prayers, disillusions, and everything in between. All are welcome here. Prepare a five-minute story about GOOD FOOD. Vittles, grub, cuisine, groceries, homemade or take out. From frozen dinners to nuts and berries, bring us stories of nourishment. From gluttony to gluten intolerance, tales of your daily bread. Doors for the Moth open at 7PM. Due to The Moth’s policies, all seating is on a first-come-first-serve basis and the saving of seats is prohibited. We cannot guarantee that patrons who arrive after the house opens will be able to sit together, and as there are a limited number of seats some patrons will be placed in the Standing Room Only area. Please be sure to arrive at least 10 minutes before the show. Admission is not guaranteed for late arrivals.